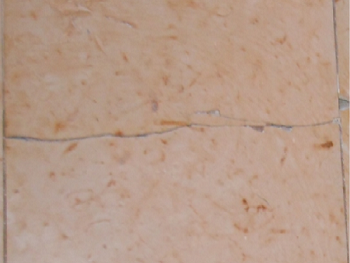 This image shows an obvious crack in the marble, right though the middle of the tile. 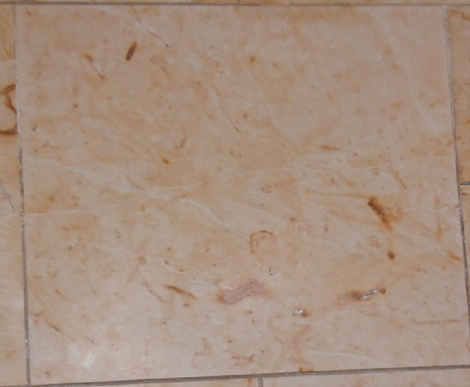 Fabra-Cleen can repair cracked marble tile so that the damage is virtually erased. Our client had recently moved into a previously owned home and was unaware there was a cracked tile in the living room. After spending countless hours visiting different stores and distributors, our client was unable to locate a tile to match the existing floor. With a different furniture arrangement than that of the previous owner, this tile would be fairly visible to people entering the room. Our client desperately wanted to avoid having to replace the entire floor. We used a tinted polyester filler to repair the crack. First, we mixed together the specified colors with polyester until we had a result that would blend with the tile, and then we pressed the material into the crack as much as possible. After it cured, we honed the tile using diamond pads and powders until it matched the surrounding tiles. As you can see in these images, the crack is virtually erased with our repair services. The homeowner was relieved that he was able to avoid both the prospect of having a mismatched replacement tile and the cost and inconvenience of replacing the entire floor. To learn more, visit our Tile and Grout Deep Cleaning Services page. Are you looking for tile and grout repair and restoration services in the NYC | NJ | CT area? Contact us online or call us at 212-777-4040 | 718-776-3564 | 516-377-0993 for a FREE estimate.